1. A section of the computer's display in a GUI that shows the program currently being used. For example, the browser window that you are using to view this web page is a window. Windows allow a user to work with multiple programs or view multiple programs at once. Almost all windows will also you to minimize and maximize them, allowing you to hide and view a program temporarily. 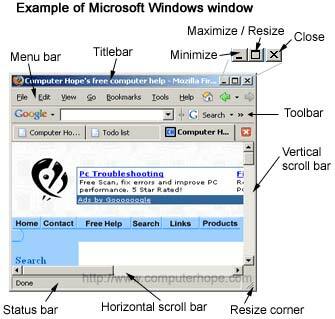 Below is an example of what a Microsoft Windows window may look like and each of its major functions. 2. When plural Windows may refer to more than one open Window and can also refer to Microsoft Windows.